In August, temperatures reach their yearly highs across much of the United States. If you’re dreaming of a cool weather summer vacation without leaving the country, these destinations are for you. Each of these locations boasts average high temperatures of less than 80 F in August. The Atlantic Ocean’s moderating effect, elevation of the Appalachian Mountains and northern latitude make for mild summers throughout much of the region. Acadia National Park, Maine – Average August Temperature: 75/55 F: Make nearby Bar Harbor your home base. Enjoy hiking Cadillac Mountain, relaxing on Sand Beach (the water is too cold to enjoy swimming most days) and watch the sunset from one of the park’s many lookout points. Block Island, Rhode Island – Average August Temperature: 77/65 F: Take a tour of the South East Lighthouse before walking down the 141 steps of the Mohegan Bluffs Staircase, which leads to a scenic beach. There’s plenty of fresh seafood to be had on the island after heading back up! Rangeley, Maine – Average August Temperature: 75/51 F: If you’re looking for a cool weather summer vacation without the ocean, try Rangeley Lake. Hiking, paddling and a few museums make for a relaxing small town trip. Wells, Maine – Average August Temperature: 74/61 F: This coastal town is filled with summertime fun, including amusement parks, golf courses and boat tours. Portland is just a half hour north along the coast, perfect for a day trip. The Great Lakes and Continental Polar air masses keep the northern Midwest states of Wisconsin and Michigan cool during the summer, making them perfect vacation spots. Milwaukee, Wisconsin – Average August Temperature: 78/64 F: There’s something for everyone in Milwaukee, including breweries, museums, architecture and lots of restaurants. Stop at the Public Market, meander down the River Walk and browse shops in the Historic Third Ward. Upper Peninsula, Michigan – Average August Temperature: 76/48 F: Even if the temperatures climb above 80 F, there are three lakes and an endless number of rivers to dip your toes in. You can also kayak, fish, whitewater raft, hike, and enjoy fresh fish and locally brewed beer. There are only a few months of the year that don’t see snowfall in the high peaks of the Rocky Mountains. You may encounter afternoon thunderstorms, so plan for a nap, museum or tour after a morning of hiking. 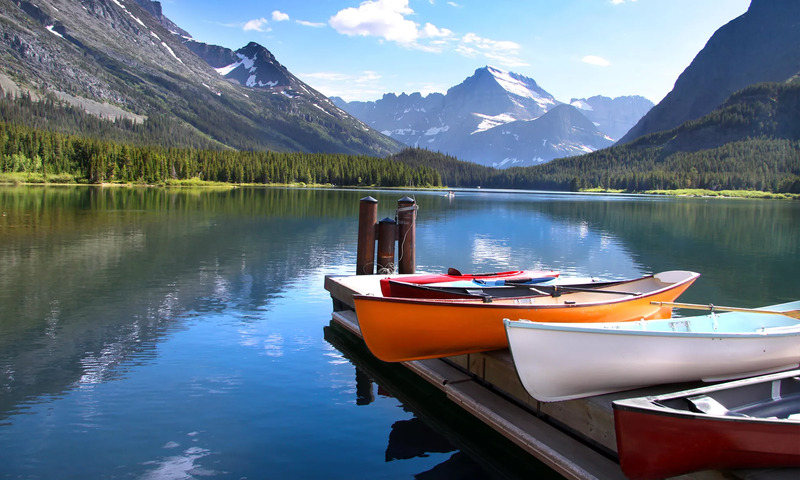 Breckenridge, Colorado – Average August Temperature: 69/40 F: There are plenty of adventures to be had after the snow melts. Go whitewater rafting, biking, hiking and ziplining. Explore the town’s art district and take in a show. Glacier National Park, Montana – Average August Temperature: 69/45 F: Winter’s snowfall keeps many of the park’s best sights closed to vehicles. During the summer, you can take in the Going-to-the-Sun Road, hike, kayak, and catch amazing sunrises and sunsets. Sun Valley, Idaho – Average August Temperature: 79/42 F: There’s lots of history in Sun Valley, which was home to the US’s first destination ski resort. Beautiful mountains, resorts, hiking trails, art galleries and refreshing lakes welcome visitors in this cool weather summer vacation destination. Yellowstone National Park, Wyoming – Average August Temperature: 71/37 F: For a truly cool weather vacation spot, try Yellowstone, where temperatures drop to near-freezing some nights. Of course, the trails and boardwalks surrounding the parks’ hot springs, geysers, lakes and rivers are must-dos. Almost any destination in the Pacific Northwest and Northern California will meet visitors with comfortable temperatures, thanks to the moderating effects of the Pacific Ocean, climate patterns like La Niña and the region’s mountainous terrain. Cannon Beach, Oregon – Average August Temperature: 67/53 F: Explore the rocky shore (low tide is awesome) and sandy beaches Cannon Beach has to offer. Trails, boutiques, restaurants and art all coexist in this oceanside town. San Francisco, California – Average August Temperature: 68/55 F: Plenty of parades, festivals and open-air concerts take place during the summer in San Francisco. Tours, museums and world-renowned restaurants are all great ways to spend temperate summer days. San Juan Islands, Washington – Average August Temperature: 72/51 F: For island life without the heat, head to the San Juan Islands off the coast of Washington. Local restaurants serve dishes made from native ingredients, artists create and sell their wares, and whale watching tours get you up close to orcas. Seattle, Washington – Average August Temperature: 75/57 F: Head to Pike Place Market, drink locally roasted coffee and spend a day on the beach in West Seattle’s Alki Neighborhood. There’s lots of great food, art and nature to take in in this cool weather destination. Olympic National Park, Washington – Average August Temperature: 62/44 F: For a rainforest that isn’t sweltering, check out the Hoh and Quinault Rain Forests within the park. Lakes, rivers, waterfalls and beaches also offer visitors plenty to do throughout the summer.